Modern technology can be a blessing and a curse. For example: did you know that sitting in front of a computer, watching TV, or even spending too much time on your cell phone can make it harder for you to fall asleep at night? Unfortunately, it's true. But that doesn't mean you have to give up your favorite TV shows, abandon social media, or find a new job just to get better rest. Fixing the problem can be as simple as buying a high-quality pair of anti blue light glasses, such as the frames that are currently for sale from Dream Elements - a company which manufacturers a wide variety of helpful sleep aids. What Do the Dream Elements Anti Blue Light Glasses Do? To make a long story short: the Dream Elements anti blue light glasses protect your eyes from being bombarded with unhealthy blue light exposure. Too much blue light isn't just bad for your eyes - it's bad for your hormones, too. And it's especially bad if you struggle to get high quality sleep each night. Blue light comes from many sources. First and foremost, the sun emits a spectrum of light during the day which, of course, includes this blue light. The reason human beings are not nocturnal is because our bodies evolved to be stimulated by the blue light in the sun's natural spectrum. When the sun goes down, and that light isn't available anymore, our bodies produce a hormone called melatonin which makes us feel sleepy. Unfortunately, in our technological day and age, the sun isn't the only thing that emits a stimulating blue light. Every electronic device you can think of - from televisions to smart phones to computers and more - emits this same light. And while you may think that a late night session of binge watching on the TV is helping you relax before bed, it's actually tricking your body into producing less melatonin, making you feel restless and awake by extension. This can even have a detrimental effect on your sleep cycle when you eventually do fall asleep. What's the Best Way to Use Dream Elements Anti Blue Light Glasses? The best way to use Dream Elements anti blue light glasses is to put them on a few hours before bedtime. This sends a signal to your brain which lets your body know that it is, indeed, night time and that it will be time to go to bed soon. This signal will trigger your brain to release melatonin. And when you have plenty of melatonin flowing through your system at night, you will feel sleepy and relaxed. Wearing Dream Elements anti blue light glasses provides a variety of different health benefits, including some not related to sleep. But, of course, sleep is the most important part. When you stimulate a healthy amount of melatonin production by wearing these glasses in the evening, you help prime your whole body for a long, solid night's rest. Not only will you have less trouble falling asleep in the first place, but you will be less likely to wake up in the middle of the night and disturb your sleep cycle. Experiencing a solid, continuous sleep cycle throughout the night is the best way to make sure you feel refreshed when you wake up the next morning. But those aren't the only health benefits you can get from owning a pair of Dream Elements anti blue light glasses. If you, like most people, spend any portion of your working hours staring into a backlit screen, then you may want to consider investing in this technology. Whether you're an office worker who has to be on the computer all day, a medical practitioner who's constantly updating patient information on a screen, or even a server who takes customer orders electronically, these glasses can help reduce the amount of strain your eyes go through on a daily basis. Protecting yourself from eye strain is a lot more important than most people think. Symptoms of eye strain include dry, red, itchy eyes and blurred vision. You can also suffer from headaches, neck tension, upper back aches, and general disorientation from staring at a brightly-lit screen all day long. And if these eye strain symptoms are lingering into your evening hours, they can interfere with your sleep quality, too. Lastly, although some bright light exposure from the sun is healthy, excessive exposure can be harmful, too. That's why it's a good idea to wear the Dream Elements anti blue light glasses if you know you're going to be out in the sun. 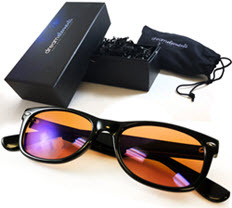 Unlike most cheaply priced sunglasses - and even unlike some high end boutique store sunglasses - the lenses in the Dream Elements anti blue light glasses have a 400 UV rating. Like most things, the higher the uv rating, the stronger the protection it provides. So not only can these glasses help you sleep better at night and prevent eye strain during the day, but they can protect your eyes from excessive sun exposure as well. There are a few things to make the dream stand out from similar lenses. For starters, there's the fact that they are manufactured to a much higher standard than most non-prescription frames. They're made of extremely durable materials which means that a single pair can last you for years. They are easy to clean, and highly scratch-resistant. Most impressively, they're stylish design makes them much easier to wear then other anti blue light frames on the market. And all of these things come with a price tag that is under $50 on Amazon. We definitely think that this makes the Dream Elements anti blue light glasses stand out among the competition. Of course, the Dream Elements anti blue light glasses shouldn't be the only part of your nightly sleep hygiene routine if you want to get the best possible rest. You can combine these glasses with many other sleep aids. Some suggestions include a comfortable, satin sleep mask, an anti snoring spray, ear plugs, or even a natural herbal sleep remedy. The more you can do to help your body achieve its most natural, deepest sleep, the better!